Was young Mars an icy world? Mars is now a dry, dusty world, but we know it had significant surface water in its past. 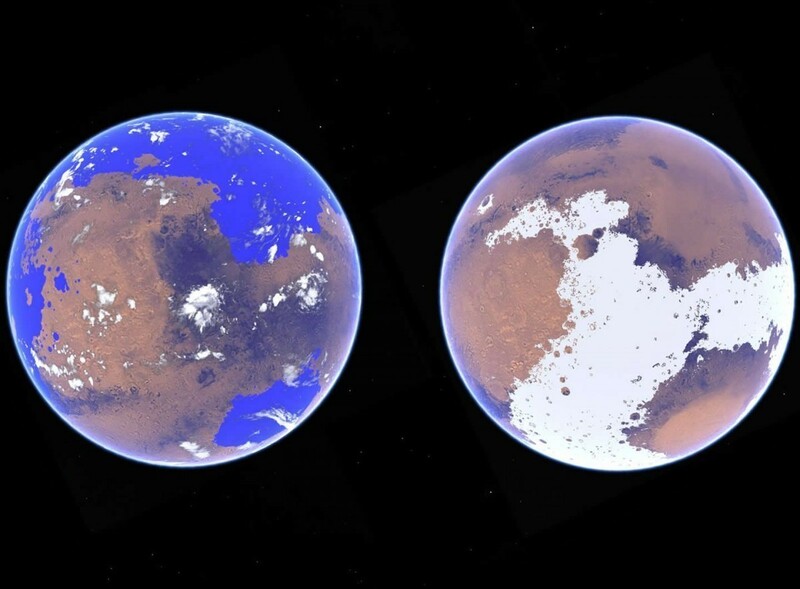 The predominant view is that early Mars was likely warm and wet, with a large ocean in its northern hemisphere. In addition to the geographic features, we also have things such as isotopic evidence to support the theory of early Martian oceans. The idea of a warm and wet Mars is exciting because it might have provided an opportunity for Martian life to appear. But an alternative model is that Mars was always cold. Early water on Mars was largely ice, much as it is today. Recent work published in the Journal of Geophysical Research supports this “cold Mars” model. The team used climate models and the orbital history of Mars to simulate both a warm/wet and cold/icy scenario. What they found was that the cold/icy model arose more naturally, given the distance of Mars from the Sun and the young planet’s axial tilt. A more tilted Mars, for example, would have caused ice to form more along the equator of the planet. This could explain some of the erosion features seen in the equatorial region. It should be emphasized that this is not definitive proof that young Mars was icy. Other factors such as meteor impacts could have triggered a warming period to produce a wet planet. But it does demonstrate that proponents of the warm/wet model of Mars still have things to account for, and the climate history of Mars remains a puzzle.